That's right, you heard correctly — Arcade Basketball Real Cash Tournaments™ is slated for release in less than 4 weeks! When we say real cash, we mean REAL CASH! Toneaphone is partnering with Skillz, a global service that provides game Developers technology to include real-money eSports tournaments into their apps. Arcade Basketball Blitz Online™ is a unique interpretation of the traditional arcade game. Everything from a contained beach setting to a neon, Tron-like stage rendered in HD, this game is surely to wow any sports fan. Players from all over the world will have the opportunity to put their money where their mouth is, and wager for some real cash! Wagering in mobile games has been an increasingly popular way for Developers to monetize their free to play games. It has been reported that some games that have implemented Skillz technology in their games yield amazingly positive results. One game has managed to make as high as $0.52 ARPDAU. This is especially important in an awfully crowded, and ever-growing app space. Indie companies can no longer compete directly with much larger gaming studios, all of which maintain stability in the higher ranks, funding their games with bottomless ad spends. Skill-based gaming is carving a new niche, which has been proven to serve indie studios handsomely well overall. For those concerned with the legality of skill-based gaming, companies such as Skillz only integrate apps that have proven to be skill-based. 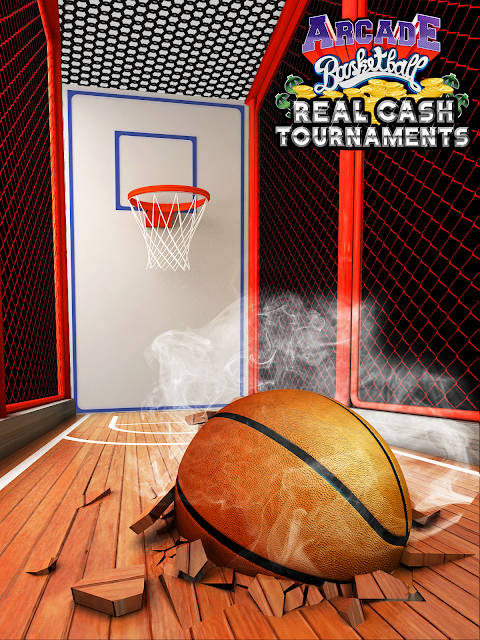 Play specialized rounds for cash prizes against other players around the world! Players are matched against each other according to skill level. Each opponent will play the same stage and have the exact rim rail randomization per match. Ultra-realistic graphics that will blow you away, Arcade Basketball Blitz Online™ captures the essence of the classic game, and gives the feeling of being at an actual arcade. - Gym: Reminiscent of the classic arcade game the Gym is minimalist yet very entertaining. - Playground: The essence of street ball juxtaposed with a playground aesthetic make the Playground special. - Beach: Drift away and have some fun in the sun at the Beach! The sand, palm trees and steel pan will take you on a mini vacation every time. Medieval: From the coffered ceilings to the ceramic mosaic floors and resonant organ, the Medieval stage truly embodies the Middle Ages. • More updates coming soon!! !